This is a guest post from Carl Sednaoui of MailCharts. 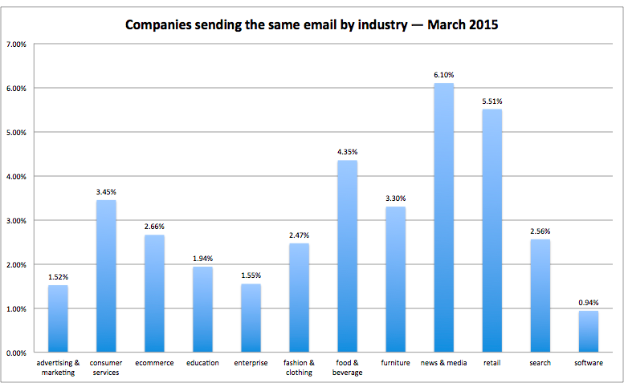 Here’s a dirty marketing secret: some companies send the same exact email more than once. They might change the subject line or send time but it’s the same copy, same images, and same calls-to-action. Why would an eCommerce company – or any company – do this? It’s simple: Drive additional sales at relatively no additional cost. No one will argue against driving sales, but it’s a good idea to keep the recipient in mind. I mean, nobody wants to read the same exact email twice. That’s where contextual and dynamic emails are starting to get really important. With contextual marketing technology, you can keep your content fresh and enhance the customer experience instead of interrupting it. We’ve selected three companies that sent the same exact email in the last 30 days. We won’t criticize or praise these emails, we’ll simply see how they could have been improved had they used either a contextual or dynamic approach. Our first set of emails come from Wine Chateau, an offline and online wine and spirits retailer. The first email was sent on Monday February 23rd at 8:57 am with the subject line “Don’t Miss This 95 Point 5 Star Gran Selezione wine”. The second email was sent on Thursday March 19th at 12:24 pm with the same exact subject line. – Wine Chateau could have created a geo-targeted email and replaced “Free shipping on 6 bottles” to “Free shipping to NYC on 6 bottles”. The added context makes this email more relevant to me since I live in NYC. See how a few changes can go a long way? Let’s dive into our next company. The first email was sent on Saturday February 21st at 10:07 am with the subject line “Choose 3 Top-Rated Samples. Plus, Fashion Week Trend Report”. The second email was sent on Sunday February 22nd at 10:07 am with the subject line “Ends Tonight, Pick 3 Top-Rated Samples + Free Shipping”. – The blog banner at the bottom is great. I wish it featured the latest post. – Dynamically change the “On trend” items. The first time this email was sent they could have featured hair products. The second time it could have been cremes. Rotating featured products in an email is really powerful. Yes, you’ll always have your best-selling items. But, if I didn’t purchase last week’s feature the first time, I’m not likely to purchase it the second time. These emails come from Moosejaw, an offline and online retailer that carries a great selection of gear and outerwear. The first email was sent on Thursday March 5th at 10:30 am with the subject line “The North Face Jackets under $100”. The second email was sent on Sunday March 8th at 10:24 am with the same subject line. Before you continue reading, take a minute to think about how you’d improve this email if you had access to a product feed and contextual data about your readers? Don’t cheat. Take a minute and think about it. – What if instead of showing the same jacket twice, different jackets were featured based on my local weather. It’s cold? Show me a warm jacket. It’s rainy? Show me a waterproof jacket. The added relevancy is likely to increase email CTR and shopping intent. You can even go as far as saying “Stay dry in NYC with this great jacket”. – Sending contextually relevant emails is extremely easy when you have access to the right tools. Contextual content ensures your list stays interested and engaged with your emails. – If you don’t have access to a tool like Movable Ink, you can still use this technique. Here’s the trick: send the same email with a different subject line only to subscribers that did not open your initial email. This is extremely effective. But, like we said earlier, nobody wants to read the same exact message twice. Make sure you exclude subscribers that opened the email the first time. Want to learn more about contextual marketing? Check out Movable Ink’s eBook, Everything You Ever Wanted to Know About Contextual Marketing. Also, if you found this article helpful, feel free to hit the share button below. Thanks a bunch and happy emailing! This entry was posted in Email Marketing on April 8, 2015 by Carl Sednaoui.